These are simple and SO delicious! 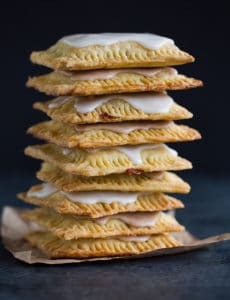 A flaky, buttery pastry with strawberry and brown sugar cinnamon fillings, and they're frosted, of course! Prepare the Brown Sugar-Cinnamon Filling: In a medium bowl, whisk together the brown sugar, cinnamon, and flour. Prepare the Strawberry Filling: In a small bowl, whisk together the cornstarch and water, and then combine with the jam in a small saucepan over medium heat. Bring to a boil and simmer for 2 minutes, stirring frequently. Remove from the heat and let cool. Make the Pastry Crust: In a large bowl, whisk together the flour, sugar, and salt. Using a pastry blender, cut in the butter until it is the size of peas and the mixture holds together when you squeeze it. In a small bowl, whisk together the egg and milk and add to the dough. Mix together with a fork until everything is evenly moistened. Knead briefly on a floured surface, if necessary, until the dough comes together. Divide the dough in half. (At this point you can wrap each in plastic wrap and refrigerate for up to 2 days. If you refrigerate the dough, let it come to room temperature for about 15 minutes before rolling out.) Roll out one piece of dough to about ⅛-inch thick, in a 9½ by 12½ rectangle. Using a sharp knife, pastry wheel or bench scraper, trim the rectangle to 9x12 inches. Cut the sheet of dough into nine 3x4-inch rectangles. Using a spatula, transfer the rectangles to a baking sheet that has been lined with parchment paper or a silicone baking mat. Assemble the Pastries: In a small bowl, whisk together the egg and milk. Brush the egg wash on each of the rectangles. Spoon a tablespoon of filling into the center of each rectangle, leaving a ½-inch of space around the edges. Refrigerate the pan with the pastries (you don't need to cover them) for 30 minutes. Bake the pastries for 25 to 30 minutes, or until lightly browned. Cool slightly before serving if not using an icing. If you plan to ice the pastries, cool them completely before doing so. Store pastries in an airtight container at room temperature for up to one week. Make the Icing: In a small bowl, whisk together the powdered sugar, milk, cinnamon (if using), and vanilla extract. The icing should have a very thick, but still spreadable, consistency. If necessary, add a splash of milk at a time, until that consistency is reached. Spread a spoonful of icing over top of each pastry and allow to sit for at least 30 minutes so the icing can set. Each filling recipes makes enough for a whole recipe (nine pastries). If you are planning to make a variety of fillings, you can scale them up or down as needed. Same goes for the icing recipes!